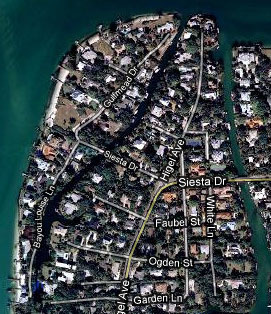 One of Siesta Keys smallest and most historic developments is Gulfmead estates. The tiny enclave of 17 homes is part of the 1912 re-plat by the Gulf Bay Land Company that created what is known today as the Siesta Rev subdivision. Just south of Gulfmead Estates lies Bayou Louise. When Gulf Bay Land Company re-platted “Siesta Key on the Gulf” they opened Hanson Bayou to Big Pass and began the construction of roads and sidewalks in the area. Gulfmead estates is the furthest most northern point of Siesta Key, it is the boaters entrance on big pass and features some of the most beautiful Homes on Siesta Key. The canal in Gulfmead Estates was dredged between 1911 and 1913 making it one of the oldest man made water features on the Island. The gulf side of the development features some of the rarest building lots on Siesta Key. Many of these homes not only have direct gulf dockage for watercraft, they also feature their own private beach. It is not uncommon for homes here to fetch more than $5 million in this location and due to this ideal paradise homes are rarely available for sale. There are a total of 11 homes on the Gulf side, 5 are on the canal, and 2 small lots are land locked. The 3 homes on the tip of Gulfmead Estates offer both gulf and canal access. It is not uncommon for homes here to fetch more than $5 million in this location. Due to this ideal paradise homes are rarely available for sale. The canal properties and land locked homes can be had for significantly less when they come on the market. As Gulfmead Estates is part of the Siesta Rev re-plat, the search results below will include any available properties in Gulfmead, Bayou Louise and the greater Siesta Rev area. Homes in Gulfmead Estates will be located on Gulfmead Drive. Gulfmead Estates is part of the Siesta REV re-plat that was done in 1913 and the listings below display all the Siesta Rev homes currently for sale. Homes in Gulfmead Estates will be located on Gulfmead Drive. Below are all of the current real estate listings available for sale in Gulfmead Estates as of 6AM this morning.